SoftExpert Project is an enterprise software that enables companies to manage their projects, products, people, services and financials by providing a comprehensive set of features that streamlines project management to accelerate project delivery with a low total cost of ownership. The software manages and automates project requests, planning, execution, control, and closing processes, automatically sending notifications to those responsible for carrying out to do tasks. It also provides several charts and reports for consistent and objective assessment of projects, resources and finances, as well as key performance indicator charts to compare results to goals set for the projects. SoftExpert Project meets requirements established by international standards and regulations such as PMBOK, PRINCE2, Six Sigma, ISO 20000, COBIT, ISO 9001, IATF 16949, FDA, CMMI, BSC and others. Capture all the requests in a single, centralized location. Aggregate, check status, delegate requests and fulfill demands for strategic projects, day-to-day activities, business relevant services, and new product development. 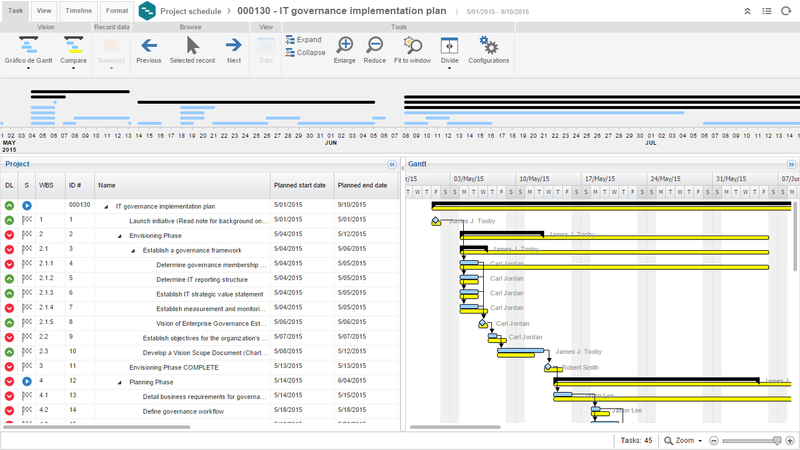 Control and manage change requests for projects and processes. Automate tasks and processes to increase efficiency. Enter the results of execution, attach files, complete checklists, start and end tasks using mobile devices. Manage scope, schedules, quality, risk, costs, and resources. Track any project metric, including status, phase, costs, cycle time and more with graphical indicators. Perform consistent and objective assessments with Online Analytical Processing (OLAP) capabilities. Manage project performance using Earned Value Management (EVM). Collect hours, progress and expenses as the work is performed. Track and manage all open issues: nonconformities, complaints, improvement opportunities, and preventive/corrective actions. Manage all project documents in a revision-controlled environment. ERP Integration: Integrate resources data (including cost and billing rates and timesheet), project cost and billing values. 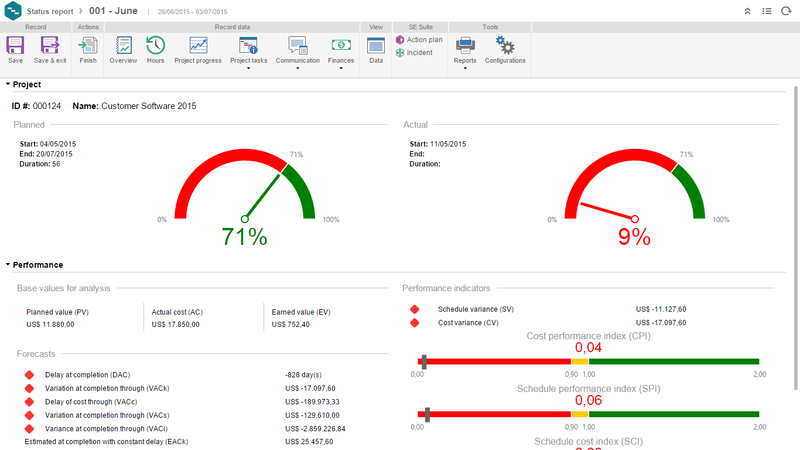 Manage project performance with up-to-date status reports. Manage resource capacity, allocation, cost and earnings. Manage and control resource capacity, assignments, utilization, and labor costing and billing. Make effective resource allocation decisions and notifications based on availability, roles, and skills and competencies. Streamline time collection and improve the accuracy of tracking the work performed, billable and non-billable hours, and time reports. 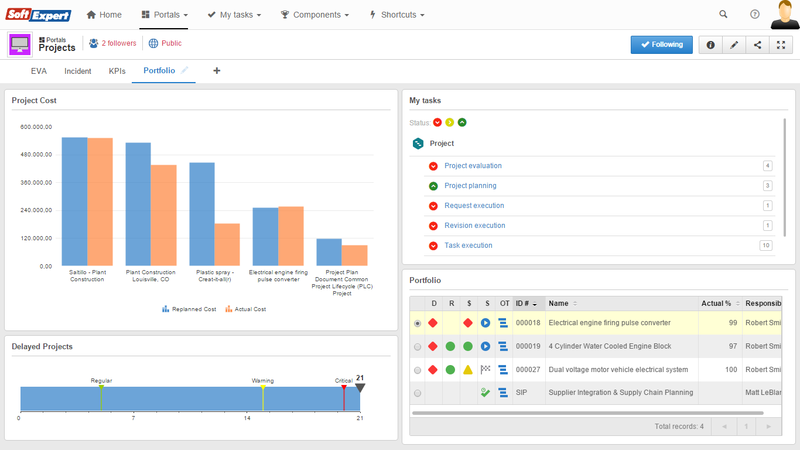 Forecast, and manage finances throughout the project lifecycle. Forecast and monitor project costs and revenues. Real-time tracking and comparison of actuals to budgets. Analyze profitability and cash flow. Support billing and financial reporting, integrate with various financial, and account systems. 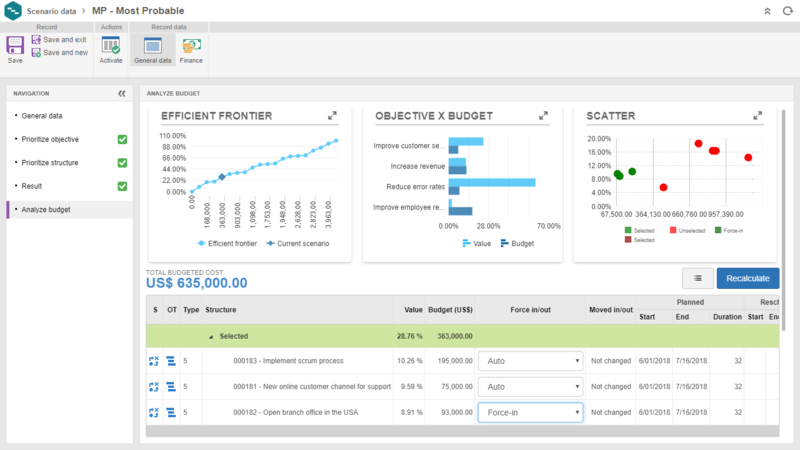 Compare scenarios and automatically select projects and programs based on budget.